Lionsbridge FC, the new PDL soccer team coming to the Virginia Peninsula in 2018, announced today that it has entered into an agreement with Nike, a global leader in footwear, apparel and equipment. 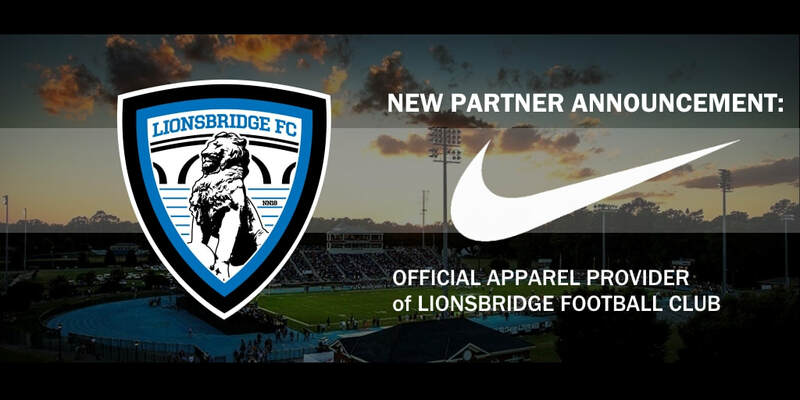 Nike becomes the official apparel partner for Lionsbridge FC and will supply custom designed kits and apparel to its players, coaches and support staff. Nike is also the exclusive manufacturer for Lionsbridge FC’s Season Ticket Jerseys, which will are available for purchase until Sunday, Jan. 21. Lionsbridge FC Season Ticket Jersey holders receive exclusive benefits and discounts. Fans wearing the Season Ticket Jersey will bypass the POMOCO Stadium ticket line at all home events. Last month, more than 400 fans voted on the team’s home jersey design. Fans who purchase their Season Ticket Jersey before Sunday’s deadline will receive their jersey during a Lionsbridge FC Preseason Celebration Event in April. Nike joins a growing list of Lionsbridge FC partners that include Chick-fil-A, Riverside and Tradition Brewing Company. Based on the Virginia Peninsula, Lionsbridge FC will compete in the USL’s Premier Development League (PDL), the top pre-professional league in North America, beginning in May 2018. The PDL consists of more than 70 teams across the U.S. and Canada, functioning as Major League Soccer’s primary developmental and player showcase platform. Lionsbridge FC will play its home matches at POMOCO Stadium on the campus of NCAA Division III powerhouse Christopher Newport University. Each home game will be preceded by a two-hour pre-game community festival complete with a beer tent, food trucks, bounce houses and live music and family entertainment. Nike is the athletic apparel supplier for many of the biggest global soccer clubs in the world, multiple national teams and nearly 100 of top NCAA programs across America, including the last three College Cup champions.